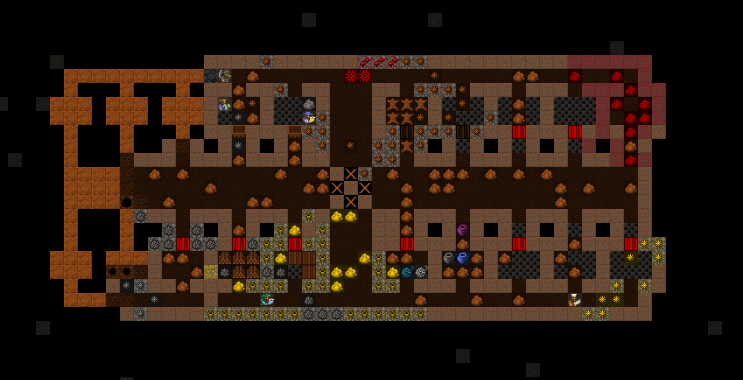 Welcome to Skullsguild. 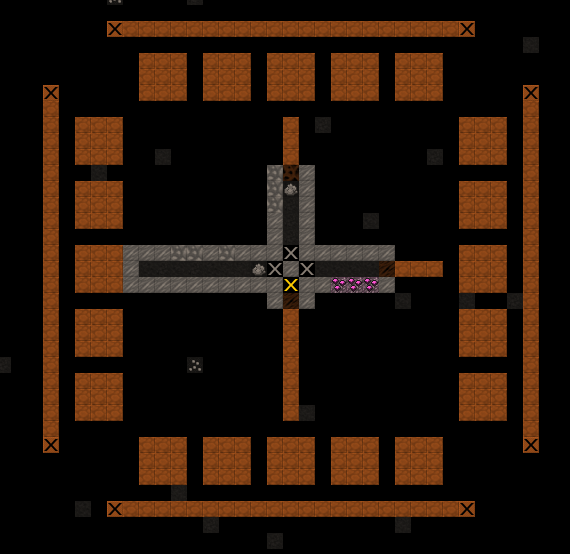 This fortress was founded by a core group of dwarves that wished to see how far they could push military training. They set out to find a well-defensible position from which to build a fortress, train an army, and begin conquering any that would dare challenge them. The first year will be devoted entirely to building a strong foundation from which to build a nation. 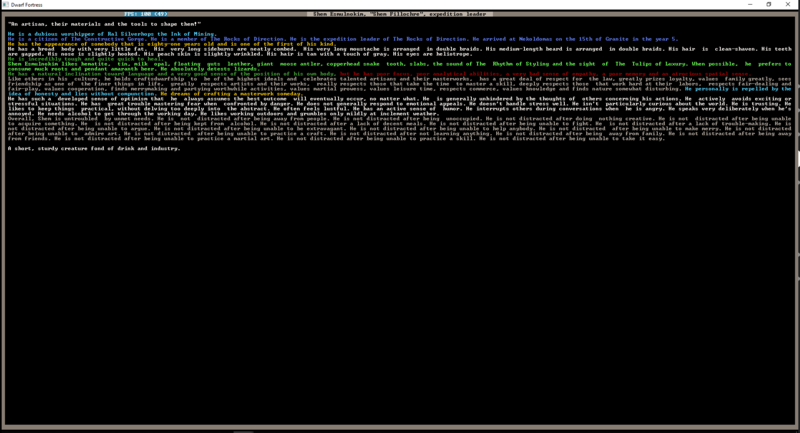 Once the second year begins, all dwarves will be drafted to the military and put on rotation. 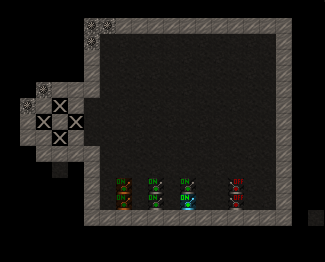 The initial rotation will start with 50% of dwarves training at any given time. 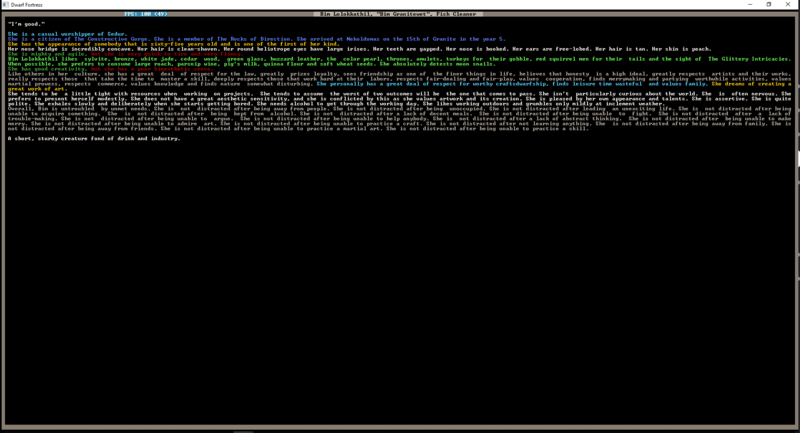 I’ll writing this from the collective perspective of the dwarves, trying to avoid any OOC talk in the write-ups. 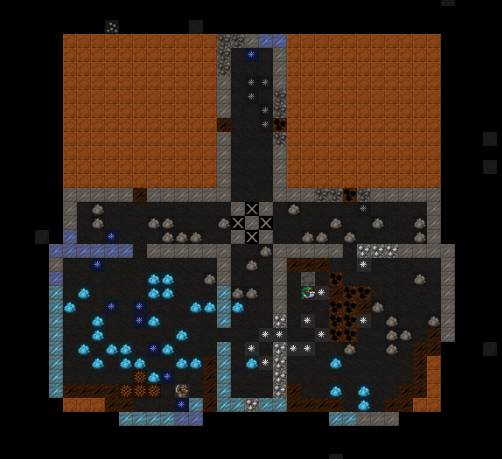 Additionally, my goal is to use no traps of any kind, instead building up my dwarves to be combat ready maniacs through training and controlled combat. I will consider locking off the fortress if something absolutely crazy comes along, as I want to survive, but I plan to engage foes as quickly as seems appropriate. 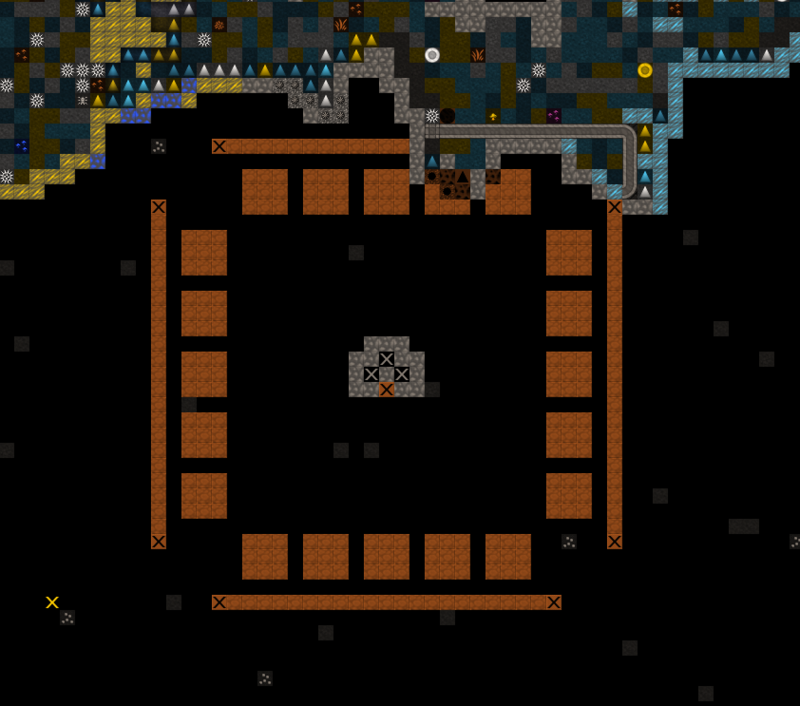 I have a general plan for this fort, basically building an above-ground fortress of stone, with baileys, towers and multiple lines of walled defense. 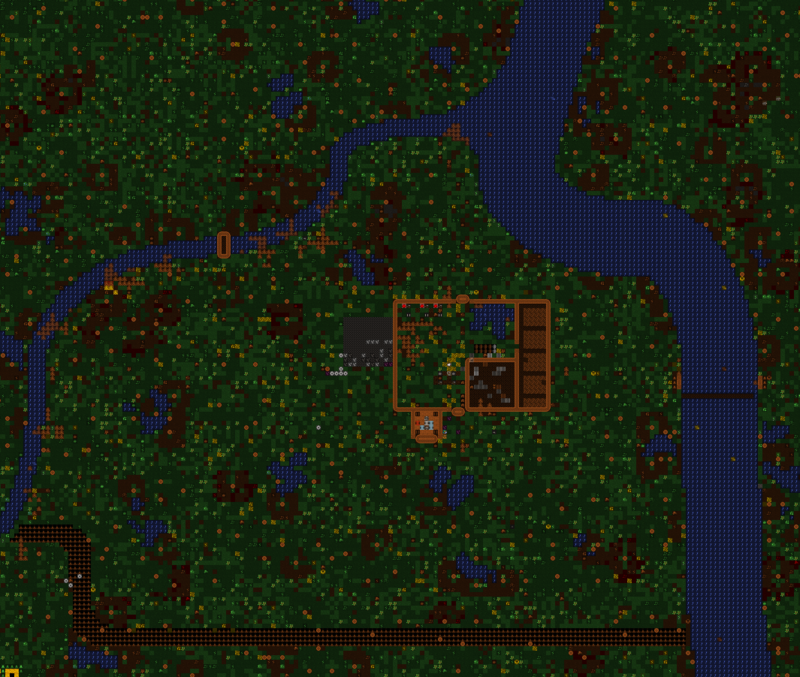 I am also going to create an encompassing moat. Below ground will be most everything else. After that, I plan to build the military and do military stuff. I haven't played with the world screen at all, so that should get interesting. Any input, as well as requests for dorfing, are welcome, but I reserve the right to make decisions. 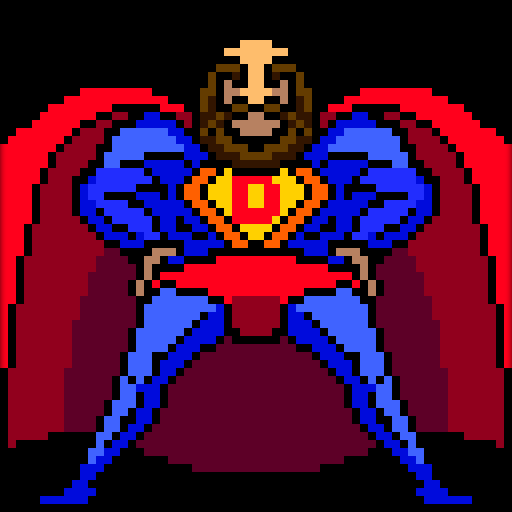 Updates will come as I decide to do them, which is likely roughly weekly. Atis Isanlikot 02 - Summer Year 5 Dead 7 Bled to death, slain by the giant cave spider Swelteredsand the Hair of Creating in the year 7. Thob Uvarkeskal 02 - Summer Year 5 Dead 7 Died of Thirst in the year 7. 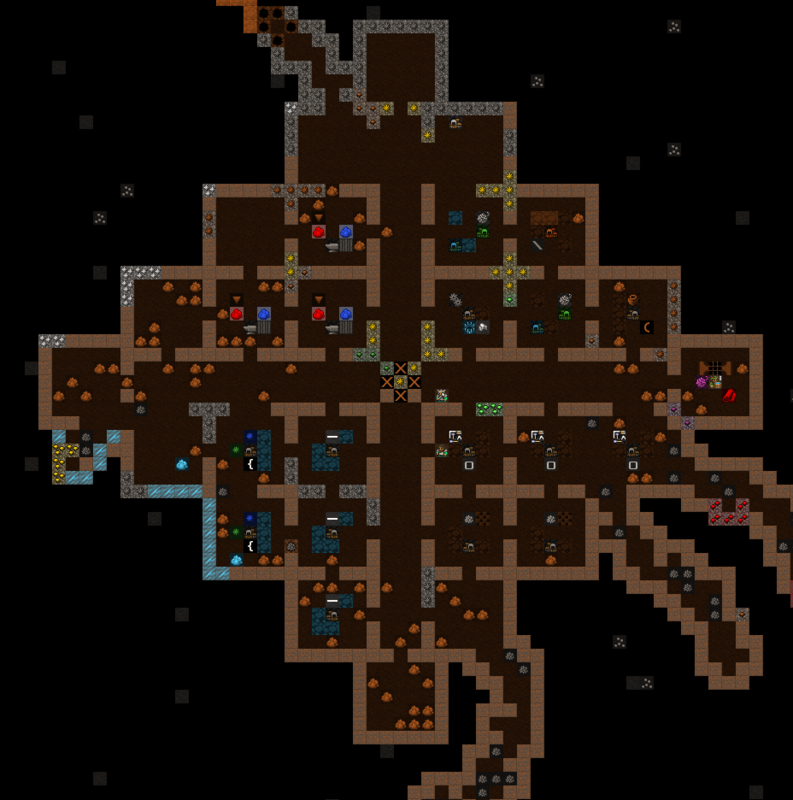 Asmel Zasitolon 03 - Autumn Year 5 Dead 7 Suffocated, slain by the giant cave spider Graycrack in the year 7. Atis Rikkiroslan 04 - Spring Year 6 Dead 7 Bled to death, slain by the giant cave spider Swelteredsand the Hair of Creating in the year 7. Tekkud Unalducim 05 - Summer Year 6 Dead 7 Bled to death, slain by the giant cave spider Swelteredsand the Hair of Creating in the year 7. 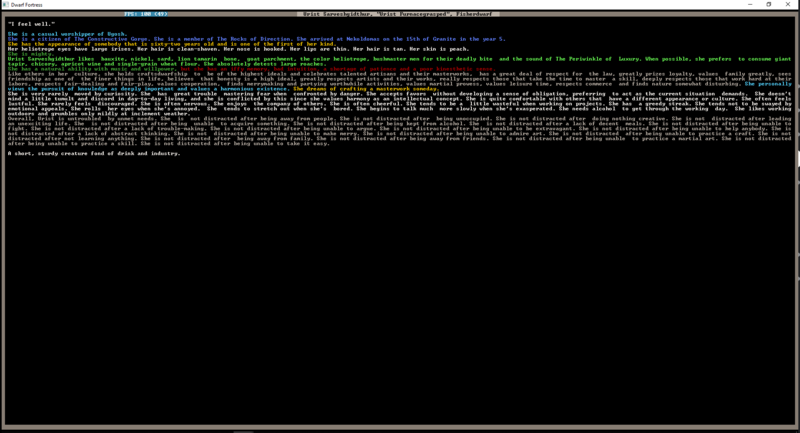 I, Shem ‘Grimmash’ Esmulnokin, welcome our band, the Rocks of Direction, to our new home of Nekoldomas. 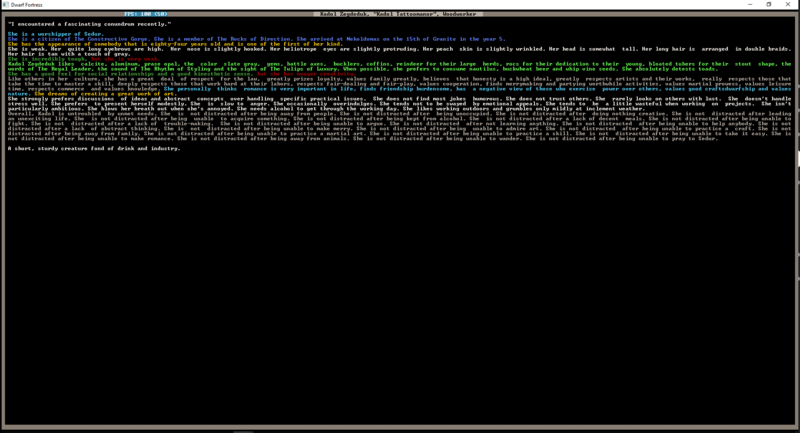 The translation is Skullsguild, for those unfamiliar with dwarven language. We will settle this place, and from this meeting of rivers, we shall build a great new nation of warriors. We shall first construct a simple wall to keep ourselves safe. Then we shall delve into the earth. 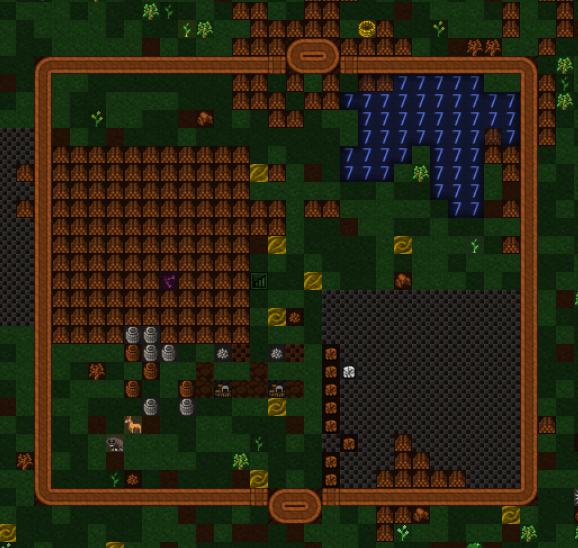 Our labors will be to initially chop down the closest trees and gather all the wood and food we can. 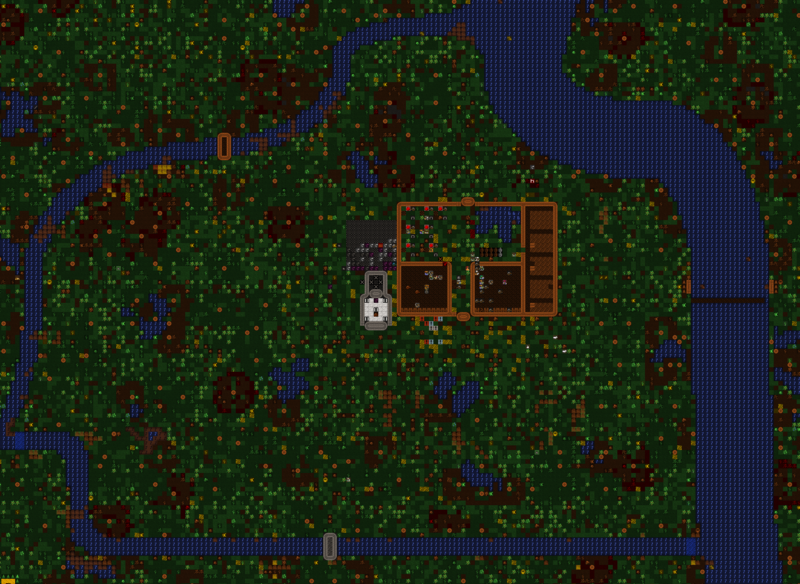 Then we will set up some farms. As a side note, it seems our local area has stingrays, alligators, and many hippos. There also appear to be some giant brown recluse spiders, based on webs we noticed. We shall make haste to fortify ourselves. Spring was a grueling time of felling trees and erecting walls, but the wall has been built, and we have our rudimentary bailey in place! 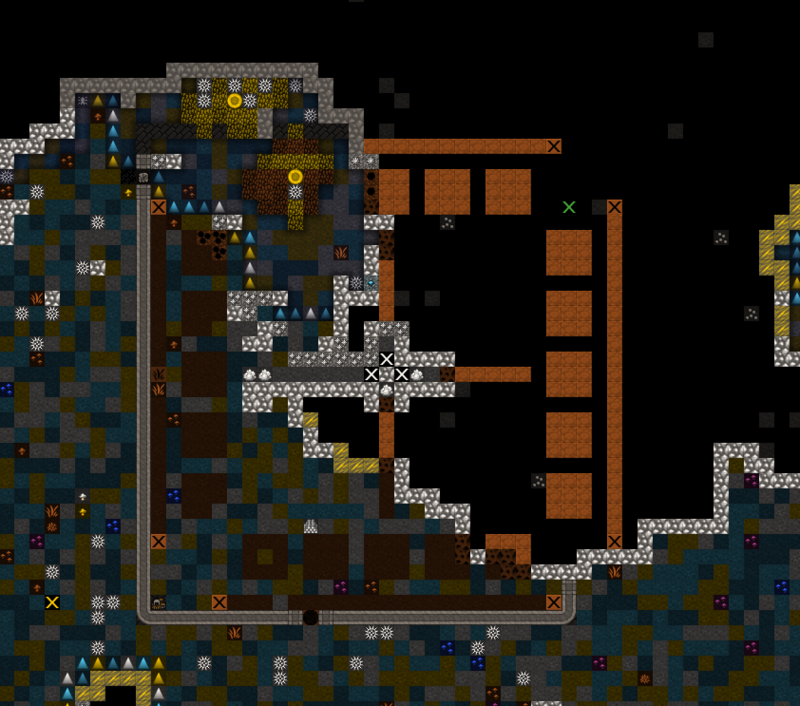 Of course this is but a prelude to the greater walls that shall come, but our fortress must begin somewhere. We have also made some bridges in order to ensure we have access to the far sides of the river. 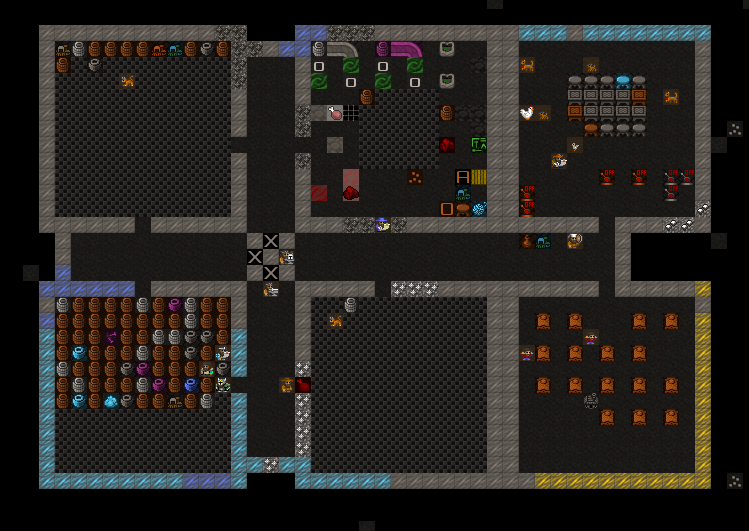 A public space with dining room and dormitory has also been laid out, along with a general stockpile and a basic plump helmet farm. No doubt these spaces will be redesigned in the future, but hey will serve for now. Our miners have also found magnetite, native copper, and hematite, along with a few gems. Our metalworking industry will be brought up to speed once we have properly established the rest of the basics. Migrants have arrived to our fledgling fortress. They came from the south, so it seems our bridge building was perhaps premature. Eight souls have joined us, among them two metal workers, and a carpenter. I shall get order furnaces up and running and task the carpenters to make some trap components to sell to the caravan when it comes. To facilitate this process, we have appointed Bim Granitewet as our manager to organize our labors. We have also decided to elect Bembul Sazimir as our broker. She seems to like art, and has some skills in chatting with others, so she might as well do. For our bookkeeper we have chosen Atis Arallogem, our future armorer. The dry season has come upon us. Our carpenters have been building the aforementioned wooden spiked balls. 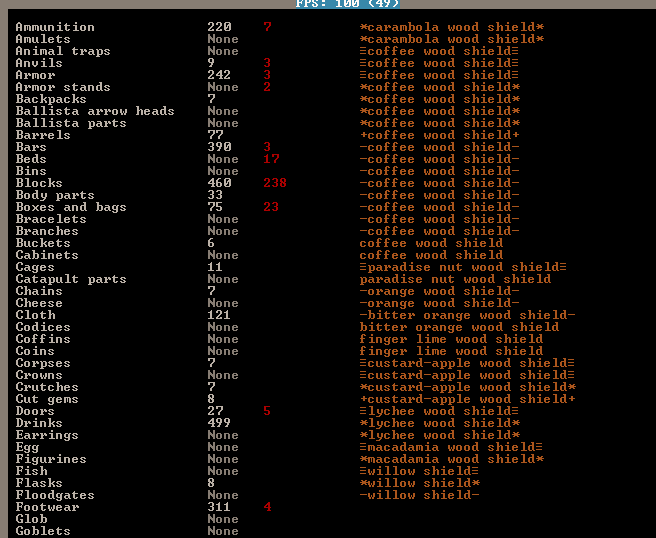 While we do not plan to use them within our fortress, we have 40 to trade to the anticipated caravan. This should allow us to purchase a great number of provisions for the winter to come. 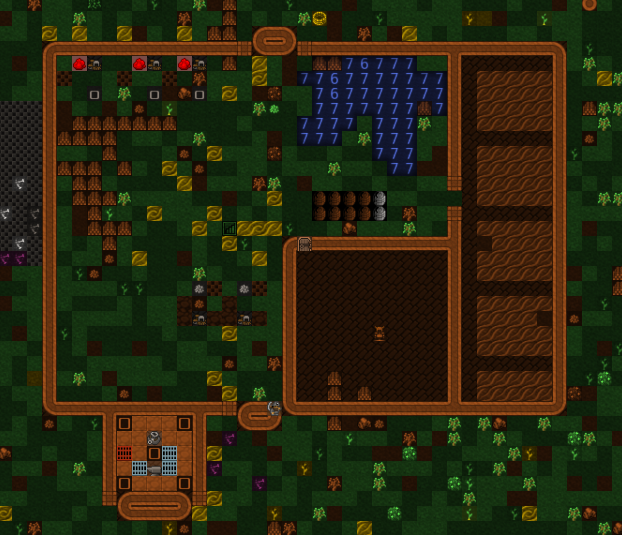 Our miners have begun digging out an initial food processing area, with space for stockpiles, a kitchen, a still, and other supplementary workshops. This will also expose more stone for our craftsmen to begin working on various items. Up near the ground level we have expanded our walls to allow for a protected above ground crops area. This, combined with the food processing apparatus should find us rolling in booze and meals within a year. Also present is our first step towards preparing our troops, a row of pumps. We each take shifts on the pumps, under the hot sun, to prepare our bodies and minds for war. We concluded our trading. The 40 spiked balls were well received, garnering us about 14,000 urists in credit. 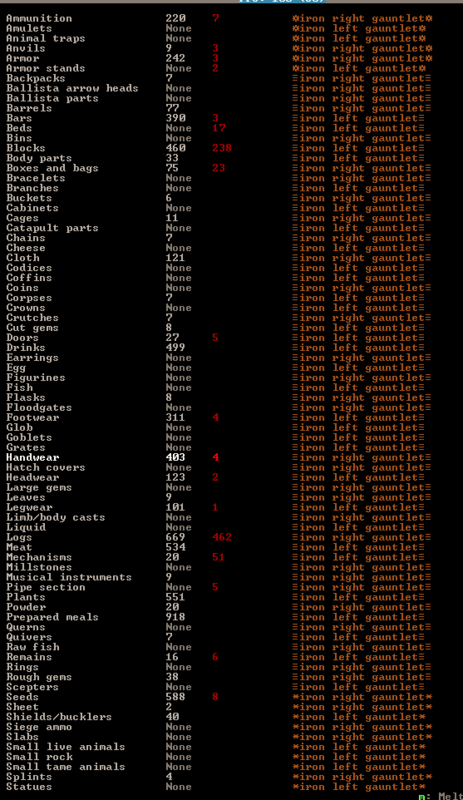 We traded for about 7,000U worth of food, seeds, drinks, cloth and leather, nearly clearing out the entire caravan of those items. Once the kitchens are cleared, we will process what we must and continue. 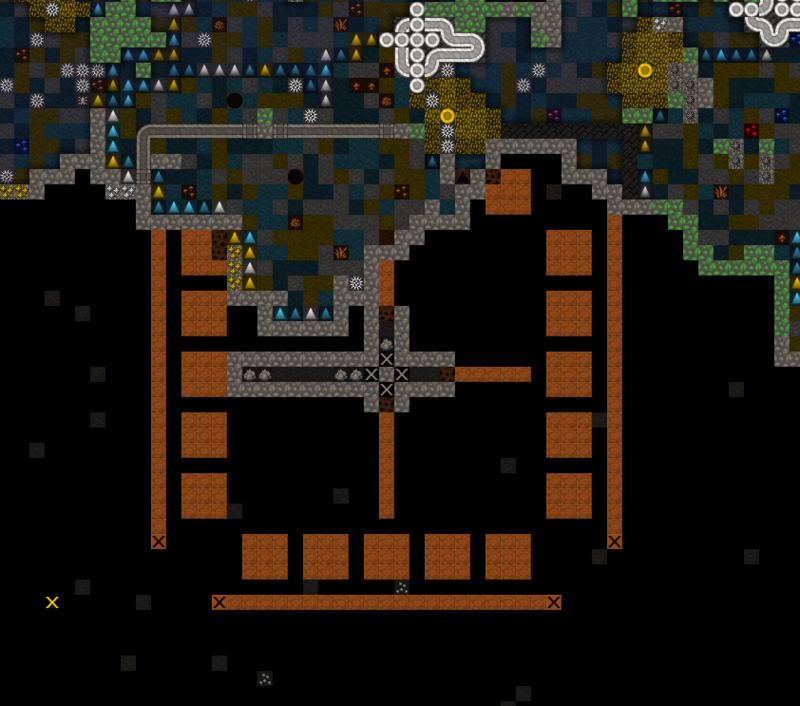 Eight more migrants have come to our fortress. Their skills seem generally acceptable, and one or two may be useful in the militia once we form it come the new year. Given our influx of labor, we are setting up some mason’s workshops to start creating pots to store our food and drink. The short days of winter are upon us. 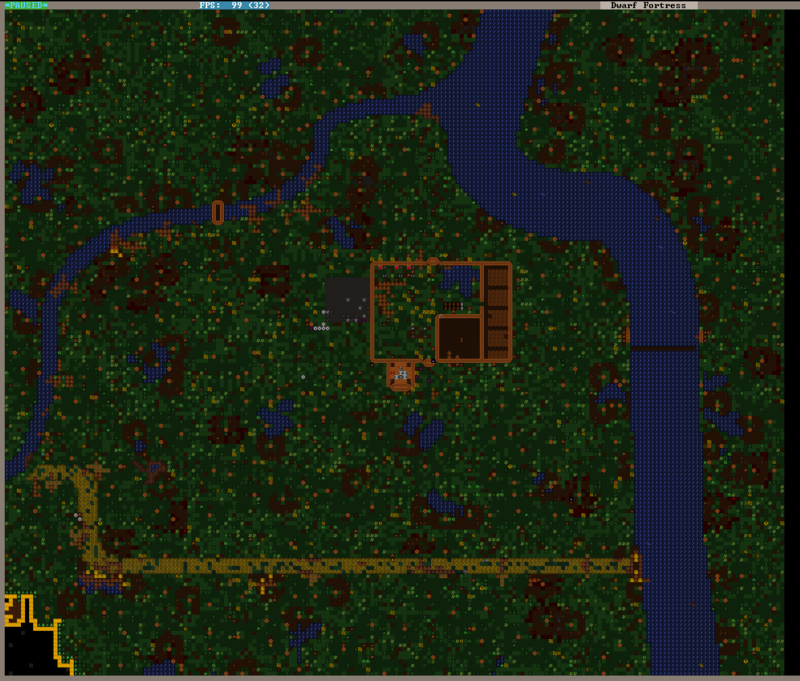 The fortress is beginning to take shape. We have started our engineered stockpiles. These will let us manage our goods quite effectively. Once the tracks and minecarts are all complete, we will have the core of our economic engine prepped. All of our gates and bridges are linked and functional. 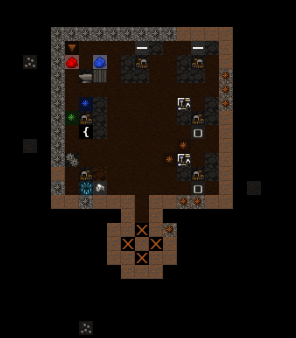 Ral Gusilatham, a dyer, has been possessed, and claimed a craftsdwarf’s workshop. He is mutter that he needs stone and rock. We should be able to provide this. 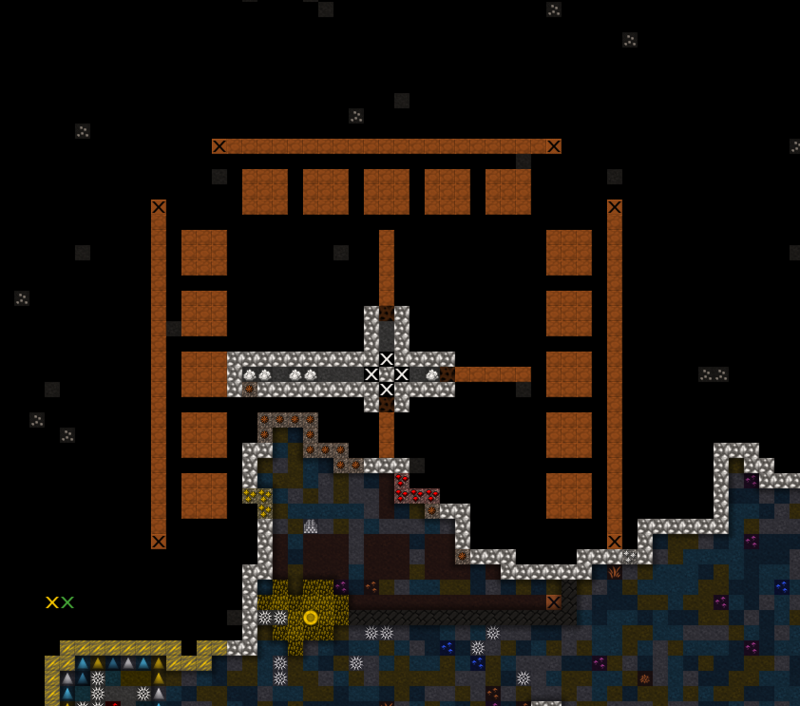 Ral has begun building something, and we all are curious to see what this dwarf will create. 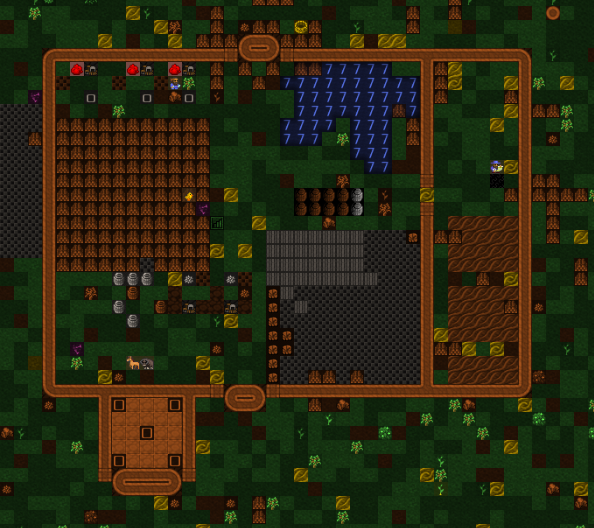 In the meantime, we have begun building our first barracks. Ral created Kokebgomath, a toy axe, and has claimed it is a family heirloom. It is made of sphalerite, and is encircled with bands of sphalerite cabochons, and has sphalerite spikes. On it is an image of a giant desert tortoise. Truly an utterly pointless masterwork. We are now beginning another facet of our defense: channeling out the peninsula to ensure we have complete barriers against our foes. We had our first major injury today. One of the carpenters, Id Kolorshar, was struck by a falling log. 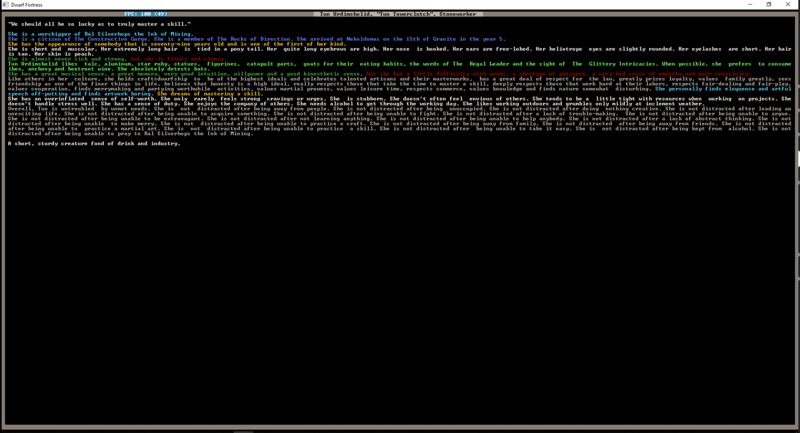 In response we have set up a makeshift hospital and appointed Sigun Risenshoduk as the chief medical dwarf. To follow up, Id is apparently ok, although his leg is injured. Very noice. Could I pleased be dorfed? As an axedwarf named Nix. Done. You get to lead one of the axe squads! Can I request to be dorfed as Shem Esmulnokin? If we ever get access to morningstars from the humans, I would like to master its use. I took him in year one, apologies. Hinted it in the write up but forgot to put it up top. Is there anything in particular you are looking for besides the morningstar? 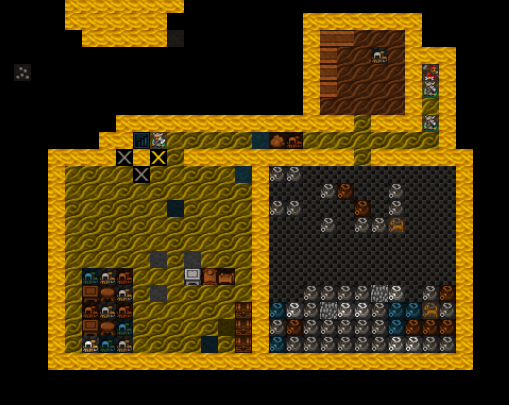 I am at 68 dwarves at the end of year two, working on the write up. Stayed up way to late. And luckily the end of year two got mildly interesting. Could I be dorfed as an on-duty hunter? Preferably with as many hunting/war beasts assigned as possible. 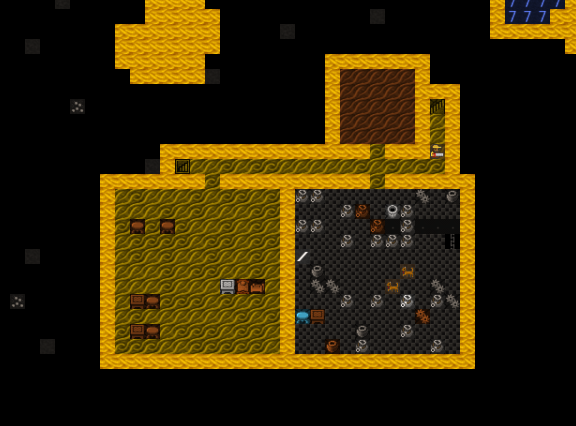 A bald male dwarf if possible. Our first year progressed well. We have made great stride in securing our land, preparing our food safety, and setting up the backbone of our storage industry. Now that our second year has come, it is time to begin building our military strength. 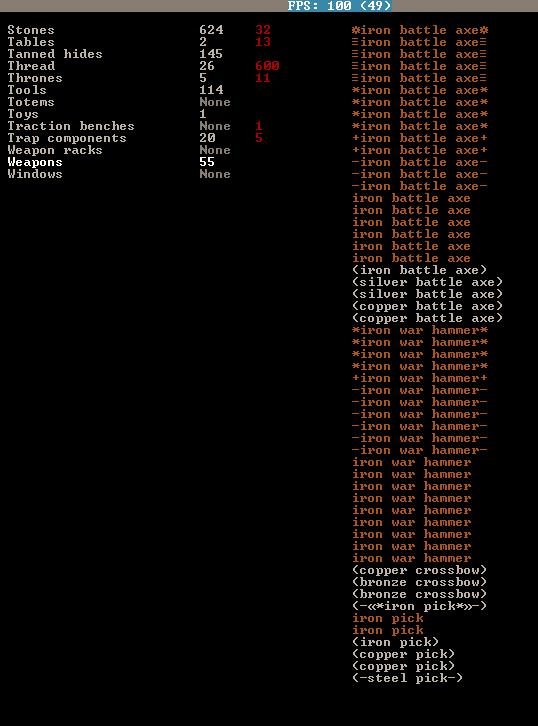 Today, we assessed our skills with hammer and axe, and assigned almost all able bodied dwarves to active duty. 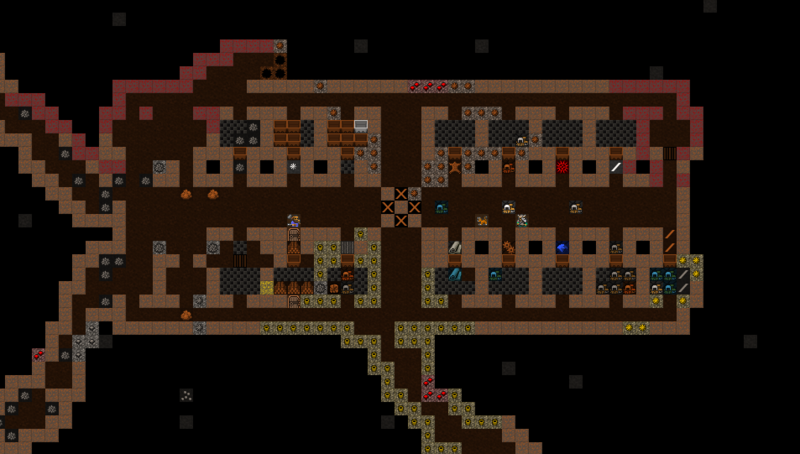 Since we have twenty three dwarves, we decided to create two squads, one using hammers and one using axes. We do not have the axes or hammers, but that will be remedied shortly as we have put in orders for axes, hammers and shields.. These two squads will trade off training each month. Once more souls arrive, we shall stagger our training again. The First Axes will be led by Moldath “Nix” Sobrilikot, and the First Hammers by Ral Cusilatham. I shall be but a grunt in Nix’s squad, as we are running our military and our industry based on skill. To make sure the fortress is well staffed, we have split our labors up with each squad containing members that can do any needed work. An elven caravan has arrived. We have nothing of value to trade them, and our bridge is not yet complete. We shall see what happens. Once the elves unpacked they had a few fruits we have not gathered yet. 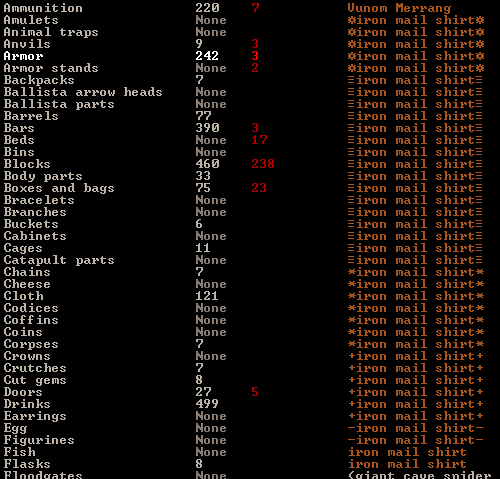 We traded away the cages we had left over from the dwarven caravan to obtain some of these items. Variety in booze is key to a strong military! 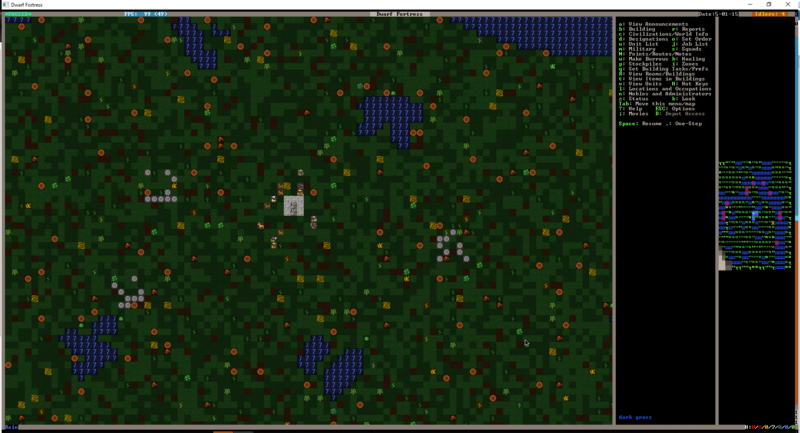 More migrants have come from the mountainhome. We gained 20 more souls. It appears we need to put two more squads into training. Cog Taguzkikrost shall lead the second hammers, while Athel Rigothlular shall lead the second Axes. We put in orders for more hammers and axes, and we will continue to fell trees to fuel our forges. Our miners are busy breaking down the levees to the rivers and preparing water channels underneath our new island. Our metalsmiths and furnace operators continue to toil in the heat, creating our weapons of war. A human caravan turned up. This should be quite interesting. We ended up trading some of those spiked balls for a bunch of food and drink, and a bit of thread and cloth. 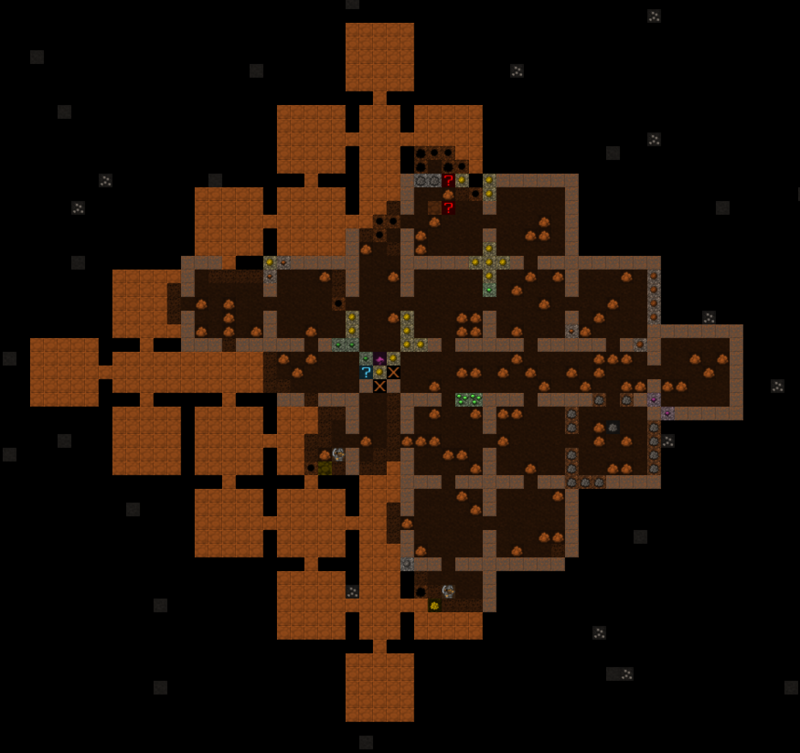 By Armok, another 12 migrants have come to our fortress. We are going to suspend adding more to the ranks after we fill the fourth squad for now. We need to get them armored first. 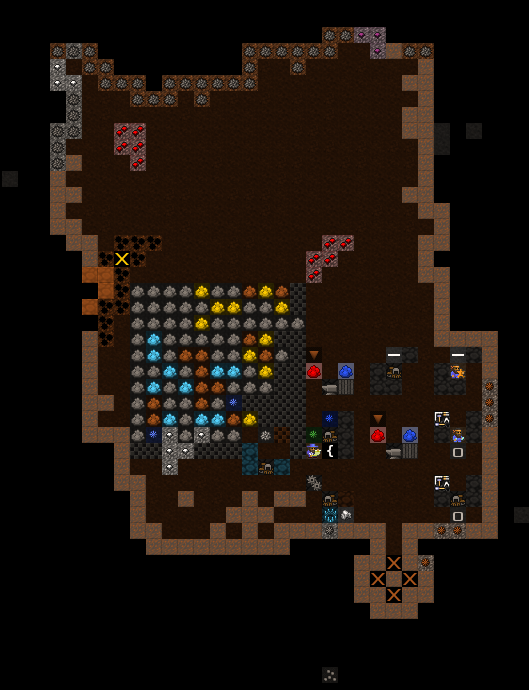 Our training goes well and weapons and shields are complete, however fully armoring our dwarves is requiring intensive mining, deforestation, and smelting. 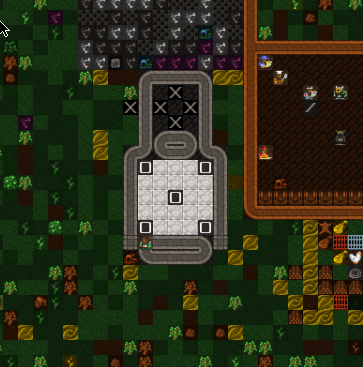 We just had our first baby dwarf! Imush Reggaroth gave birth to a baby boy, Cerol Endokroth. The Boy’s father is Adil Urrithid. The couple arrived to our fortress last fall, so I think they had the bun in the oven when they arrived. At this point we have one baby and a handful of immigrant children. I am glad our last liaison took our message of limiting underage immigrants seriously. Our moat is ready to flood. It is time to open the floodgates! Our miners found some native platinum after digging out a hematite seam! In order to help streamline our industry we have also laid out a new plan for the workshops, located directly above our storage area. The old plot was many floors away, and was quite haphazard. The carpenters were still above ground! Shorast Toradobok has been taken by a mood. 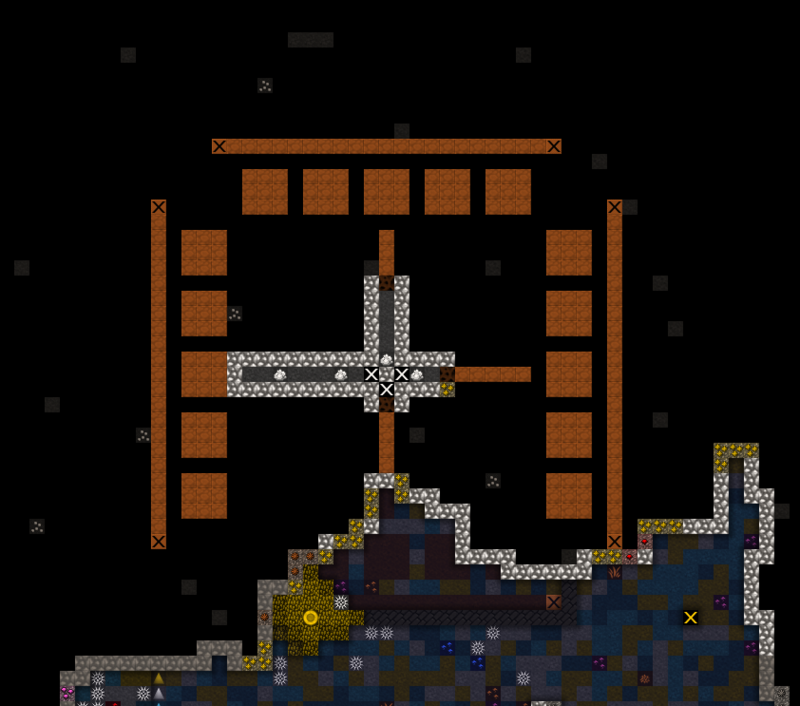 He proceeded to run to a metalsmith’s forge, then grabbed some iron bars, and began making something. After nearly a week he made Etolamnek, and heirloom iron chain. It is an iron chain, encircled with bands of iron. Well, at least this is better than the toy axe. Perhaps we will use it in a well at some point. Our industry is in full swing. Our militia squads are training. 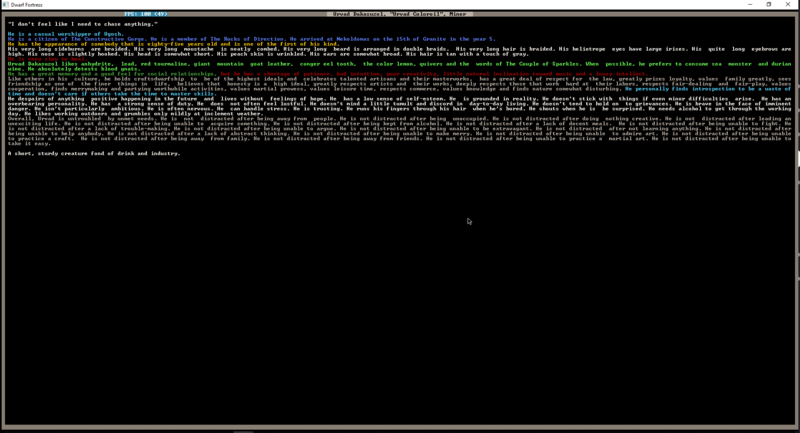 After finding some seams of bituminous coal and more iron ores, our armorsmiths are honing their crafts. In order to start standardizing and improving efficiency, we have laid out a new workshop floor. Our Liaison has arrived again. It is Ineth Bubnuserith this year. The caravan from Abenerib has also arrived. We will begin hauling our goods up to meet them. 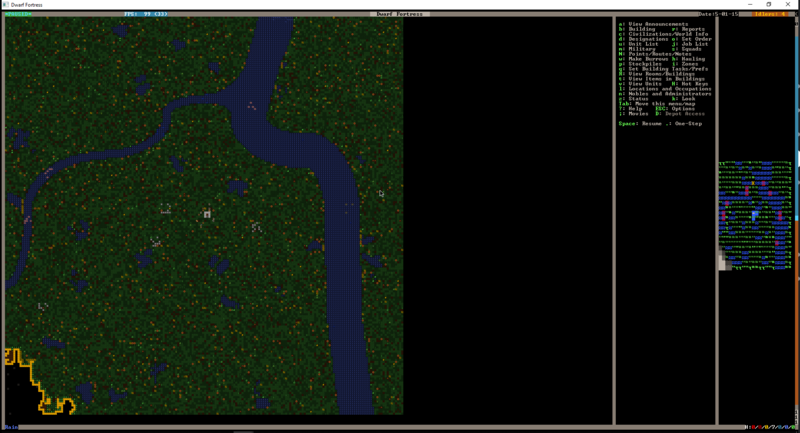 After review of the depot, we also decided it was time to begin improving our fortifications and traffic patterns. 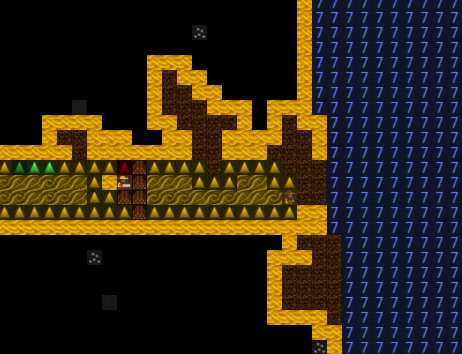 We nearly missed the last caravan due to hauling those giant corkscrews along a winding path. By build walls, of solid slate, and connecting our depot entrance to the main stairwell, we’ve cut the hauling distance to a third of the previous trek. We also have a much stronger entrance. Yet another wave of migrants came, 10 this time. This will help shore up our labor and speed up completion of the initial wave of armoring. We have begun designating bituminous coal seams for strip mining to try and remedy our constantly dwindling charcoal supplies. Trading a single piece or charcoal for 9 coke nuggets is fantastic, and we cannot ignore it. Morul Isramiden was taken by a mood. The soap maker took over the metalsmith’s forge. 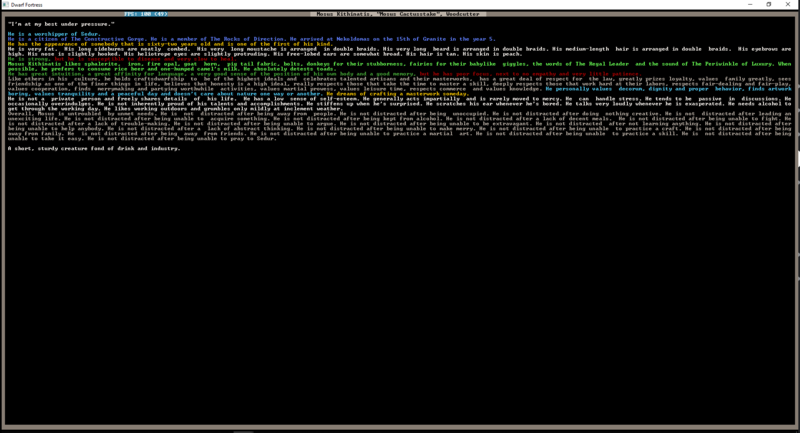 He ran about gathering up iron bars, some cut indigo tourmalines, and some logs. Some six days later she came out with an heirloom iron breastplate, decorated in wood and gems, with an image of a gem. I have added it to my uniform, as such a fine piece of armor should have a place in our combat ready ranks. Eventually the central shaft will be completely dug out save bridges to balconies around the rooms. This may be adjusted, as there are safety concerns with this. This obviously complicates our bedroom plans. Luckily our masons have been consistently toiling away, shaping raw stone into blocks. Using these blocks we quickly built walls to provide some barrier to the caves until we can assess a proper entrance. Completing the bedrooms will take a bit longer than planned! 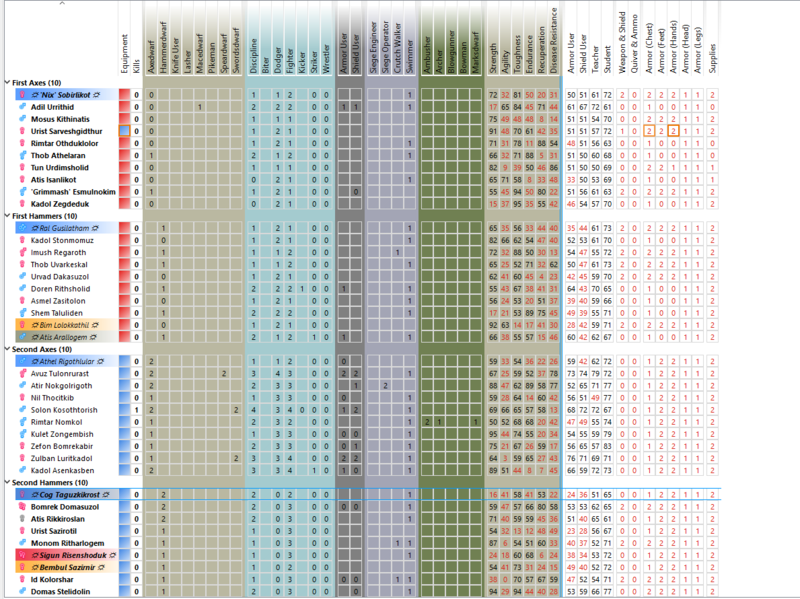 Overall, it has been a mostly dull but very productive year. Our stocks of food and drink are good. 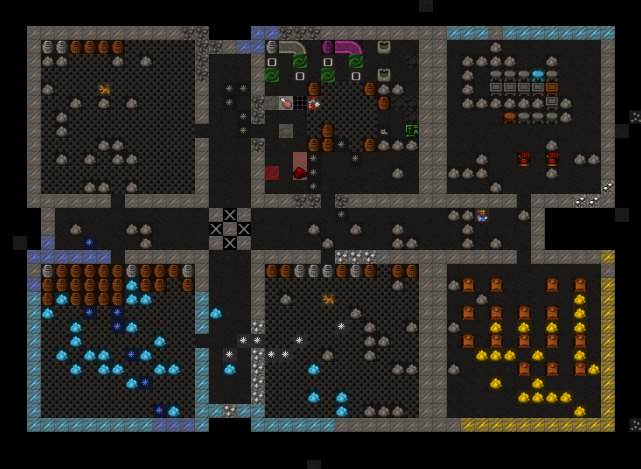 Our dwarves are training up into their squads adequately, our industry is producing what we need. A tour of the fort as it stands may be the best way to show the current state. The next floor down holds our future water channels, in case we need to divert some of the river for other uses. These channels are controlled by two double drawbridges. Nine floors lower is our workshop complex. 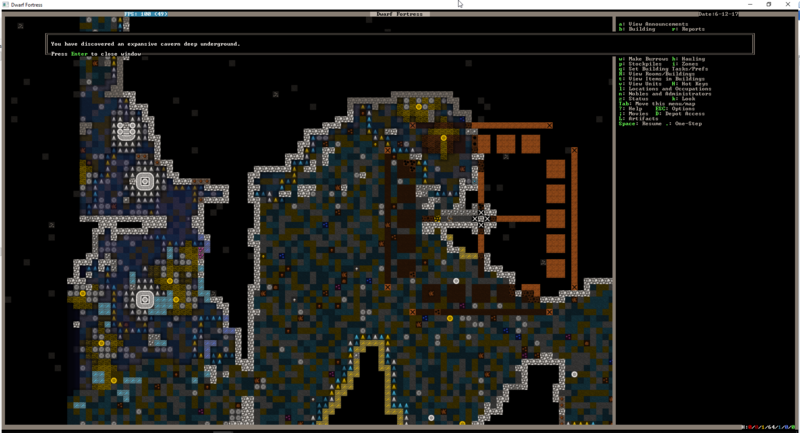 The intervening floors have the old workshop space and various dug out sections of mineral veins. OOC: Just got our first petitions, a monster slayer. I put a poll up to decide what to do. Come vote! This has great potential. 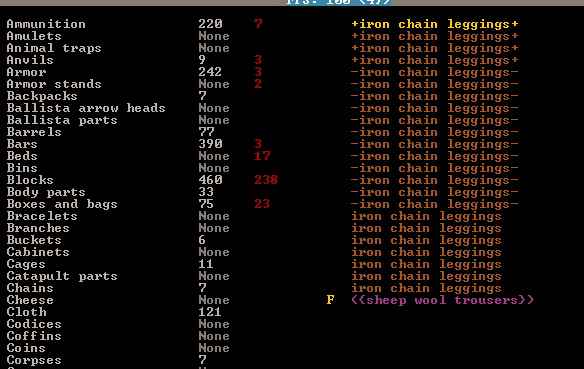 Dorf me as 'Arnie' the male hammerdwarf, please.